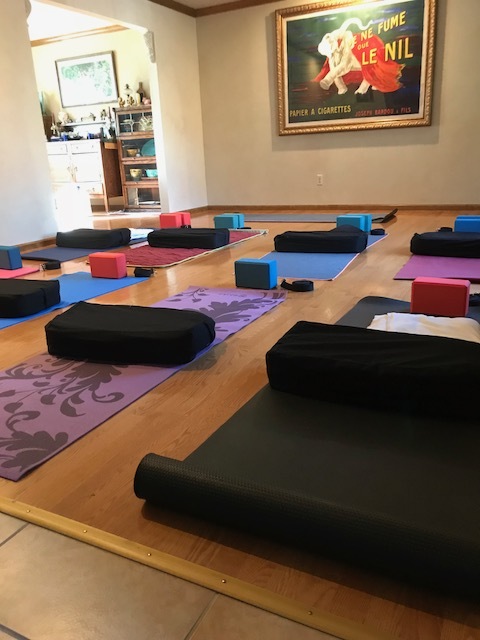 Join Me for class at cOMpassion Yoga! In this intimate suburban DTC setting, you’ll enjoy small class sizes and experience gentle, thoughtful classes, sprinkled with stories, themes and a chance to challenge yourself. All classes are taught by Janie Gianotsos, RYT 500 and IAM Yoga Amrit Desai certified Nidra instructor. Janie’s sequences are designed to take you deeper into your journey of the self, through the self and to the Self. Come spend 60 or 75 minutes in class to discover the amazing peace, relaxing calm and expansive understanding yoga can bring to your life. Yoga is good for the soul and all levels are welcome to attend class. For more information, please contact Janie by clicking here. To view Janie’s full teaching schedule at all studios, click here. For a map to cOMpassion Yoga, click here. Class is currently offered most Saturdays from 1:00 – 2:15. Click here to view the full schedule. Janie will be there at least 15 minutes prior to class. Please come at least 5 minutes early. Classes start on time.